New polls show Democrat Michelle Nunn with the edge in Georgia and Sen. Jeanne Shaheen hanging on in New Hampshire. The American public remains deeply disaffected with politics. And is anyone actually watching the candidates debate? 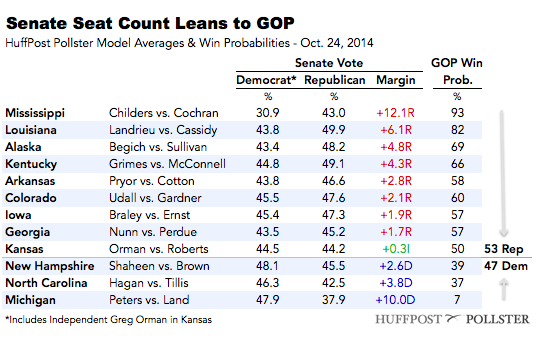 This is HuffPollster for Friday, October 24, 2014. While polls have shifted in Nunn's favor, the HuffPost Pollster tracking model appears skeptical. The model's estimate, as of this writing, still gives Perdue a slight, 1.7 percent advantage (45.2 to 43.5 percent). Although it rates the probability of Perdue finishing first on November 4 at just 57 percent, barely better than a coin flip, the spread between the candidates is slightly more pessimistic for Nunn than the averages of other poll aggregators, such as Real Clear Politics (Nunn +0.9) and Daily Kos (Nunn +1.8) and FiveThirty Eight (Perdue +0.5). Even the classic Pollster regression trend estimate (now available via the "create your own" tab in each chart), gives Nunn a slight (1.2 percentage point) advantage. Why the statistical caution? Until recent weeks, polling in Georgia has seen highly variable results, with relatively few polls from non-partisan firms without large house effects.The Pollster model's unique calibration feature aims to adjust the trend lines to match the trends shown by better performing non-partisan pollsters, but that list of such pollsters has been short in Georgia, including since August just SurveyUSA, CBS/Times/YouGov, the Atlanta Journal Constitution/Abt SRBI and now CNN/ORC. Only SurveyUSA so far has tracked from September through late October and their earlier polls help pull our model's estimate of the Nunn trend line down. So, Nunn's current standing is likely better than our model's estimate, if the five most recent polls are accurate. Keep in mind, however, that the margin separating the candidates in Georgia on November 4 is somewhat beside the point. Unless the leader wins a majority of the Georgia vote (50 percent plus 1), Georgia will hold a runoff election between the two top finishers on January 6 to decide the ultimate winner. Our model estimates just over 4 percent support for Libertarian candidate Amanda Swafford in Georgia. If that vote holds, it would likely produce a run-off election, given the currently close contest between Nunn and Perdue on the various models. Polls on a potential run-off have been rare so far. 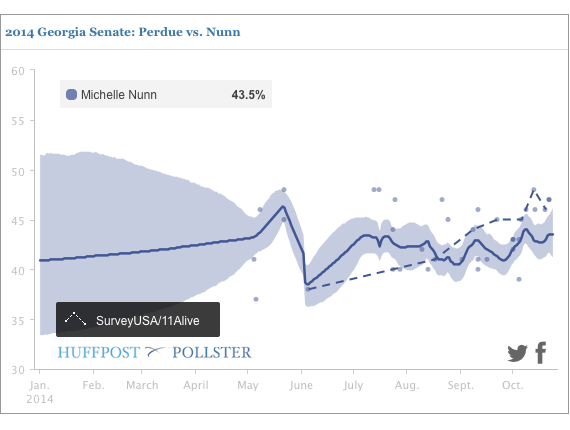 The CNN poll is the first since early October to test a two-way runoff match-up between Nunn and Perdue and the only poll since July to show Nunn running ahead (51 to 47) in that contest.